A car appears to have been driven along railway tracks after being found abandoned 40ft down the line from a crossing late last night. Emergency services were called to a crossing in East Preston, near Littlehampton, at around 11.45pm on Saturday, September 24. 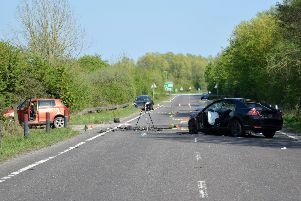 According to a fire service spokesman, the abandoned car was found on the westbound track, around 40ft to the east of the crossing towards Worthing. Fire crews attended along with British Transport Police and Network Rail. Firefighters had to wait for rail track engineers to arrive and confirm the track wasn’t live before investigating. A heavy rescue tender with a winch was used and it took around an hour to remove the car from the track. The spokesman did not report any injuries, and it is unclear if rail services were affected.